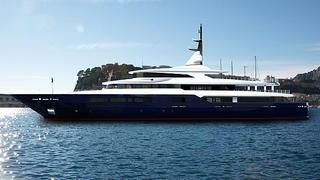 Burgess tell me that they've signed a 65m new superyacht project for sale, the Tankoa S65. The yacht is well specified and modifications are still possible according to a client's wishes including various interior design options, the yacht provides a spacious and attractive accommodation layout with owner and all guest accommodation on the upper and main decks. Spacious open interiors are complemented by impressive outdoor areas over each deck. Other highlights include a large cinema/library on the main deck, light-filled dining on the upper deck and a guest elevator serving all decks. Twin 2480hp Caterpillar engines will give her a range of 5,000 nautical miles. Available 18 months after contract signature, the Tankoa S65 is asking €42 million.